Maamoul are buttery date filled middle eastern cookies that will melt in your mouth and are utterly scrumptious. Naturally sweetened with dates these have minimal added sugar. They are popular at Eid, Christmas and other holidays. 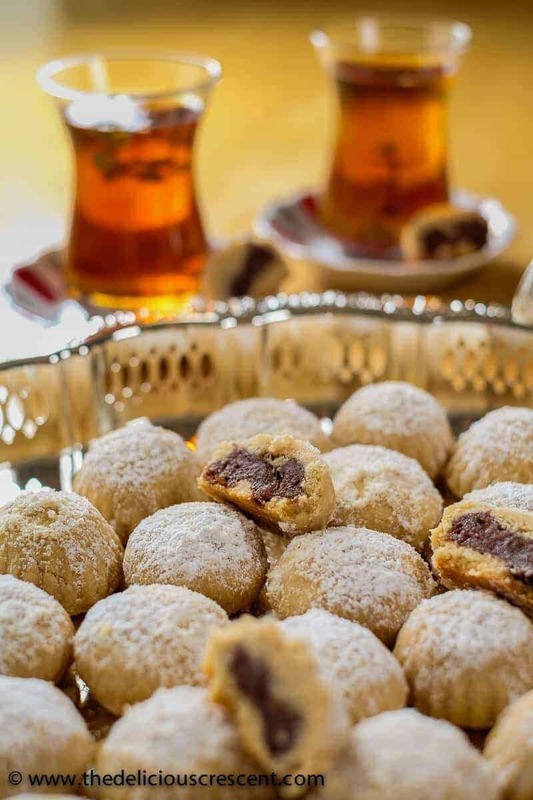 Maamoul cookies are the famous middle eastern shortbread pastries filled with dates or nuts. They are traditional at religious holidays in the Levantine region. And are made by hand or using special wooden molds to create different shapes – round like a ball, crescent form, shaped as a dome or flattened as a disc. 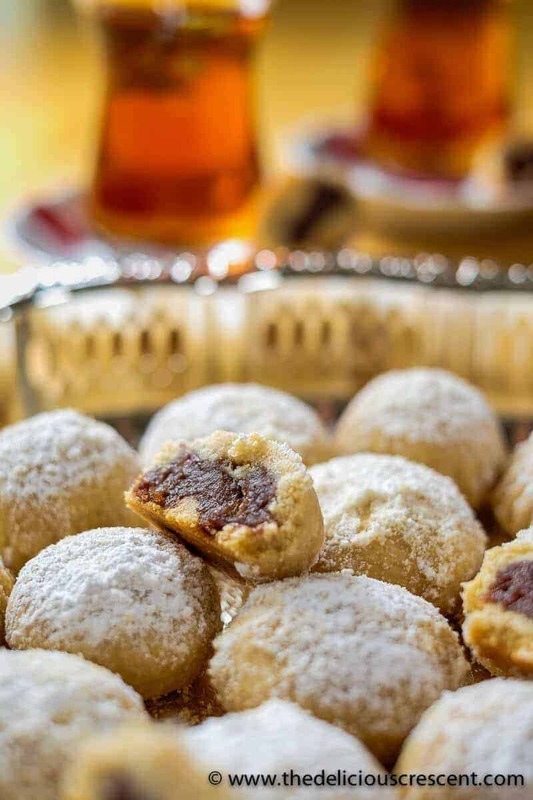 If you are looking for a Maamoul recipe with flour, without yeast, without semolina, and with dates, then this is the one for you. And with this recipe you can learn how to make them handmade or using a cookie mold. By the way, I came across an interesting story that these maamoul cookies may actually have an ancestry in the Egyptian cookie – Kahk, that is shaped like a pyramid and dates back to the Pharaonic era. So much for the lofty beginnings! When I was newly married I saw boxes of store bought maamoul at my husband’s place and so I decided to learn to make them. I collected recipes from many sources and experimented several times until I found what I liked best. And trust me – the homemade ones are absolutely mouth watering! I personally do not prefer the semolina based maamoul dough and like the cookies flavored just with rose water. No cinnamon. No orange flower water. Although, the later two flavors are popularly used in the Levantine region. But, for these date filled cookies, I just like to enjoy the natural unflavored taste of dates wrapped in a rose scented buttery dough. I love using dates to create sweets and desserts. They are sumptuous and satisfying. For someone with a serious sweet tooth :) just one cookie does it for me! Dates are high in fiber, potassium, magnesium, vitamin B6 and a good source of niacin, calcium, phosphorus, iron; in addition to other vitamins and minerals. Therefore they are a much better alternative to refined sugar. Studies have shown that the high fiber containing dates may help with lowering of cholesterol and triglycerides. The mineral content of the dates make them beneficial for bone health. Dates are rich in polyphenols that have been found to have anti-atherogenic, antioxidant and anti-inflammatory properties. The fiber in dates helps with staying regular and relieving constipation. However, dates are a rich source of carbohydrates and energy. When consumed in balanced amounts they are a great alternative to refined sugar. And work well for healthier desserts, such as – my Luscious date avocado chocolate truffles and Sahlab (orange blossom cinnamon drink). 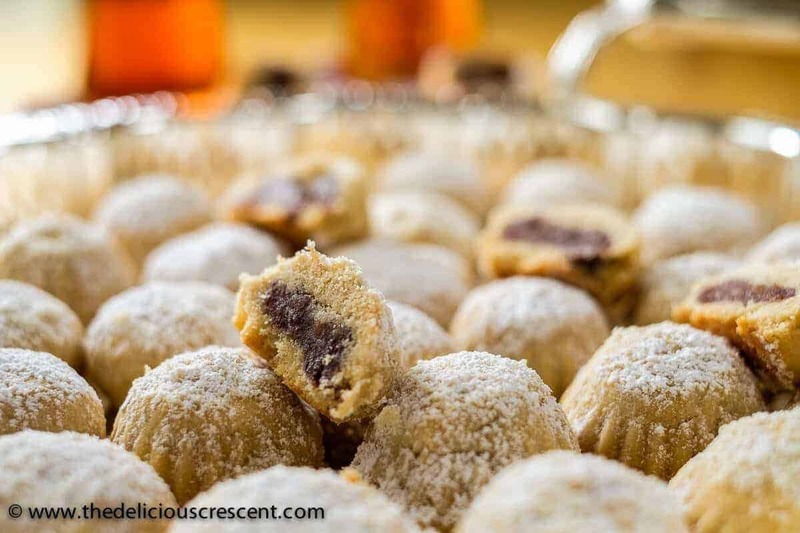 Maamoul are naturally sweetened with dates, so are healthier than cookies that have a lot of refined sugar. But it is still a rich cookie dough made with butter, so enjoy these in moderation. The steps and the tips in this recipe are written with the idea of making the maamoul cookie recipe accessible to the non-traditional consumer and baker. I learned to make them as someone outside the Levantine culture. So I hope that these tips are helpful to you as well. I prefer to make them using fresh medjool dates. But I have outlined in the notes section below how they can be made with dates that are not that soft. Also, if you are using date paste, do make sure to look for any pits. I have always found a small fragment of a pit in the readymade date paste. And it can be dangerous if the pit fragments are left in the filling. The date paste can be a bit sticky to work with. Application of some oil to the palms or using safe food prep gloves may help while shaping the date paste. I actually substituted half the flour with whole wheat pasty flour and it tasted great. There was absolutely no difference from the all purpose flour. But if you do not have whole wheat pastry flour, you can just use all purpose flour, as cookies are not typically consumed in large numbers. I prefer using ghee for making these mamoul as it imparts a nice nutty flavor. Ghee is quite easy to make from butter – check it out in the recipe notes for these Nan-e Nokhodchi cookies. Traditionally butter or ghee is used for these cookies. For those who would like to make a lighter version of this cookie, some oil substitution works great with no impact on taste. You may use any odorless healthy oil for the recipe. I think that it is fun to make maamoul cookies by hand, but if you prefer, you can use maamoul cookie molds to create beautiful shapes and impressions. Where to buy Maamoul Molds? You can purchase maamoul cookie molds at middle eastern grocery stores and online on Amazon and other sites. How to Store Maamoul Cookies? Do make sure to store the cookies in an airtight container and they will stay fresh for a long time. But perhaps they will disappear sooner than that :) ! Can I Freeze Maamoul Cookies? Yes you can wrap them well and pack in freezer safe containers or bags and freeze. Thaw them and lightly warm in oven for fresh tasting cookies. What cookies do you make at home? 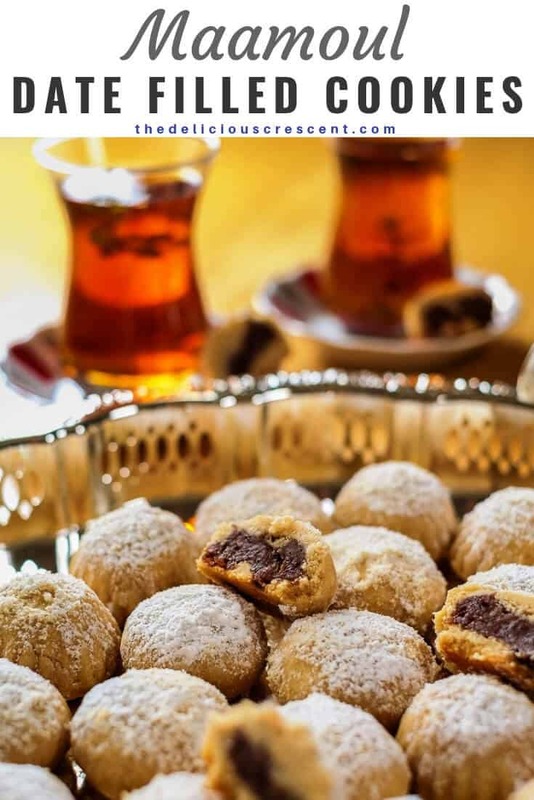 Did you try these famous middle eastern date filled Maamoul cookies? Melt the butter or ghee. Add oil and then mix in the sugar. In a large mixing bowl, combine the ghee/sugar mixture with flour, working them together with your fingers. Let the dough rest for a half-hour. Then roll out 32 portions of the dough into smooth balls. I find this easier because all my cookies more or less turn out the same size. Process the chopped medjool dates in a food processor into a smooth mass. If not using soft medjool dates, check the notes section. Divide the date mass into 32 portions and roll them into smooth balls. Use oil or safe food prep gloves if needed, as the date mass can be sticky. Take a dough ball and flatten it. Hold it in the center of your palm and cup it. Place a date ball in the center. Bring the edges of the dough together. Pinch the dough to seal well and then smoothen it out. Press it into a disc. Use a nut pick or fork to create interesting patterns. Or press the date filled cookie dough into a traditional maamoul mold and gently press to get the pattern on the cookie. Invert and tap the front edge of the mold onto a hard surface like a kitchen counter, and hold your palm under the mold to get the cookie that is released from the mold. Alternatively, a maamoul mold may be used to shape the cookies. In this case, a portion of the dough is first pressed into the mold. Then the date filling is layered on top of the dough. Next, another portion of the dough is layered over the date filling and smoothened out. Tap the front edge of the mold on a hard surface like a kitchen counter, and hold your palm under the mold to get the cookie that is released from the mold. Sometimes I find that this method may not work out too well for all. As it may be difficult to release the cookie dough out of the mold. Sprinkling a little bit of flour into the mold prior to using it may help release the cookie better. Or laying a piece of plastic wrap into the mold prior to packing it with the cookie dough and the filling may help too. But my preferred method is to make the cookie by hand and then pressing it gently into the mold to create the pattern. It is not traditional to use the mold this way, but it works better and speeds up the process. Place the Maamoul cookies, smooth side up (for hand shaped cookies) or the patterned side up as applicable, on a large baking sheet. Make sure to space them one to two inches apart. Bake for 15 to 20 minutes. Do not let the cookies over bake or turn too brown. Well baked cookies will appear dry on the surface unlike the moist look of raw dough. Also, they will have a light tan. Cool the well-baked Maamoul completely on a wire rack. Using a sieve dust some confectioner's sugar or a combination of the sugar with some almond meal. Store the Maamoul cookies in an airtight container. 2. You can use one packet of pressed dates (no more than 13 oz) which you can get online or at any middle-eastern store. Just make sure that you check for any pits. 3. If using dates that are not very soft, then place the chopped dates and add some water in a saucepan (start with 2 tablespoons water and add as needed). Dry dates may require more water. Heat it at medium high and when the water bubbles, lower the heat and simmer. The dates should cooked down to a smooth and solid mass. Turn off the heat and allow to cool. 4. Make sure to not use too much filling, or the cookies will crack. Perhaps you may know what I did wrong? May be used more butter or oil by mistake. Or perhaps more milk than necessary. Did you by chance use any baking powder? In case you may have used incorrect metric measures…. Oh, forgot to mention that I added 3/4 cup of pistachios to the date filling. Wonderful recipe. everyone thinks they are delicious. Thank you. I plan to make some with oil only as a low cholesterol option, I know the taste will change but still will be good. I mixed almond flour with the wheat and came out really good. Thanks Sandra. So happy it worked out well. And appreciate you sharing how you made it with almond flour. Hi Roxana! These Maamoul look delicious! I’m making them today but not sure about the oven temperature. How much should be the oven temperature to bake these? Hi Vineeta, sorry, had been traveling. Thanks so much. As in recipe it is “Preheat the oven to 350°F”. Hope you enjoy it! Hi I am Lebanese and always watched but never learned to make them until now,can I use dried figs instead of dates,and if so do I need to do anything different? Thank you. 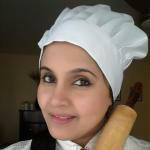 Hi Nadia, So glad that you would like to try this recipe. If using dried figs it will depend on how moist they are. For this recipe I used really moist medjool dates and just processed it. I didn’t need to cook it. But if the dried figs are too dry then you would need to chop them into small pieces and add just a little bit of water, increase the heat for the water to bubble and then lower the heat, and simmer. Use a ladle to break up the dried figs, once cooled process into a smooth mixture. Start with only a little bit of water and add as needed and it will depend on how dry or moist they are.